Last year we did a nice Christmas blog on the viscosity of beer where myself and Steve Carrington took our Microfluidic rheometer down to our local pub to measure a selection of their traditional ales and correlate the results with drinking experience of course. Since then I have been asked a number of times what is the viscosity of the ‘good old black stuff’, otherwise known as Guinness. I am not sure whether my colleagues think I have an extremely sensitive and well calibrated palette or that my drinking partner is a microfluidic rheometer, but off the top of my head I did not know. Nevertheless I took on the challenge to find out, this time employing our Kinexus rotational rheometer. I popped down to our local Morrison’s to pick up a four pack of Draught Guinness, and after putting the other three under my desk for safe keeping I headed down to the lab. Conscious that the rich white foam that forms on the top of a fresh pint of Guinness is the result of dissolved gas molecules nucleating and forming small bubbles that rise to the surface, I poured my glass of Guinness and left it to stand for over an hour before making my measurements. Since the recommended serving temperature for Guinness is around 6°C this was the temperature the measurements were made at. Expecting Guinness to be a low viscosity Newtonian liquid, meaning its viscosity is independent of the amount of shear applied, I was pleasantly surprised when it displayed non-Newtonian, shear thinning behaviour. This suggested that there was some inherent structure at low shear rates which was broken down as the shear rate increased…..but what caused the structure? Draught Guinness is a drink that has attracted the interest of Physicists, most notably for the way in which its tight frothy head forms from the wave like motion of bubbles. In fact it is the nature of these bubbles and the gas that constitutes it which makes draught Guinness look and taste the way it does. 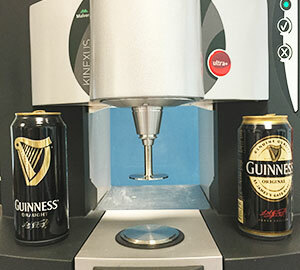 Most fizzy drinks, including Guinness Original, contain dissolved carbon dioxide which forms large bubbles when the can is opened (and the pressure drops) and contributes to the more acidic taste associated with Guinness Original. Draught Guinness on the other hand contains a mixture of nitrogen and carbon dioxide, the former being less soluble (and less acidic) than CO2 and forms smaller bubbles as a result when the can is opened. In draught Guinness, nucleation (or the process of forming a bubble) usually has to be initiated, meaning that gas molecules must come together to form an embryo bubble of sufficient size to survive and grow. In the pub this achieved through the pump design, and in a can by means of a widget, which produces a turbulent stream of Nitrogen. What happens if bubble nucleation is incomplete? Could these un-nucleated microbubbles be contributing to the low shear viscosity and hence apparent shear thinning? Remembering a past visit to the Holiday Inn at Scotch Corner, where they used a clever device called a Surger to nucleate bubbles in special cans of ‘Surger Guinness’, I thought of trying something similar. A Surger is basically an ultrasound device and so I put my Guinness sample in an ultrasonic bath to replicate this process. Interestingly there was some froth generated on the surface during ultrasonic bathing suggesting that something was happening….but what about the viscosity? 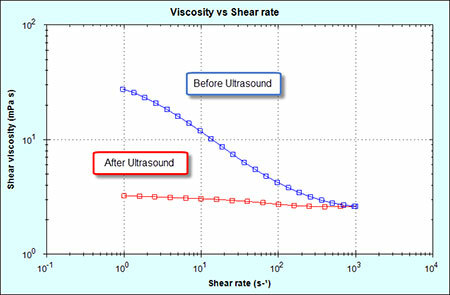 As the chart below shows, before applying ultrasound there is clear non-Newtonian behaviour with higher low shear viscosity but after ultrasound the same sample is almost Newtonian. Although this is far from a scientific study, and was never intended to be so, it does perhaps suggest a causal link between gas/bubble composition and viscosity but more importantly the use of rheological measurements to pick up these differences. For the record the low shear viscosity plateau for the sample exposed to ultrasound was approx. 3.2mPas and the higher shear value approximately 2.5mPas. So after this short study I think the answer to the question ‘What is the viscosity of Guinness? is not a straightforward one. The flow properties of draught Guinness are as much about the gas bubbles as the liquid and it is the combination of both that make it so unique. So much so that approximately 13m glasses of Guinness are expected to be drunk around the world today according to Diageo, which is equivalent to 7.5m pints. As a big fan of the ‘black stuff’ I will certainly be contributing to this total and hope you can find some time in your busy schedules to study a pint of Guinness for yourself – Happy St Patrick’s Day! You might be interested in our upcoming live webinar, also presented by me!